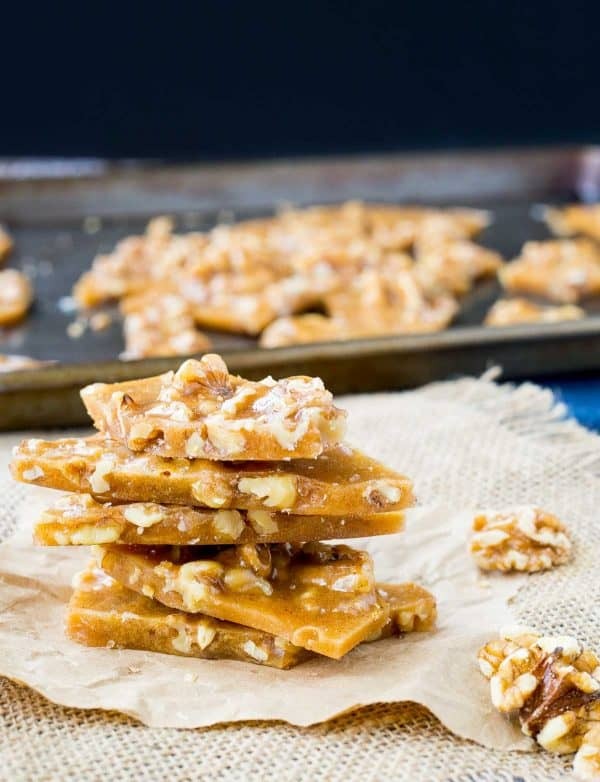 Perfect for gift giving or snacking on at parties, this Walnut Brittle with Cinnamon and Cloves is easy to make and so flavorful thanks to toasted walnuts and warm spices. I’m partnering with California Walnuts to bring you a year of nutty and delicious walnut recipes. This post is sponsored by California Walnuts, but all opinions are my own. I’m a little obsessed with cloves right now. They’re so warm and cozy and perfect for the holiday season. Ever since I tasted those coffee cookies with cloves, I haven’t been able to get enough of them. They’re a key player in pumpkin spice and gingerbread, but they can also be used in a more subtle way in savory recipes — adding a little extra something something to this 5 ingredient slow cooker ham or enhancing the flavor of a curry powder. Not to mention the fact that they have health benefits. 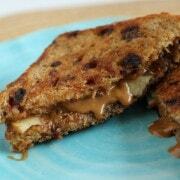 Paired with heart-healthy walnuts (did you know they’re a great source of omega-3 fatty acids? 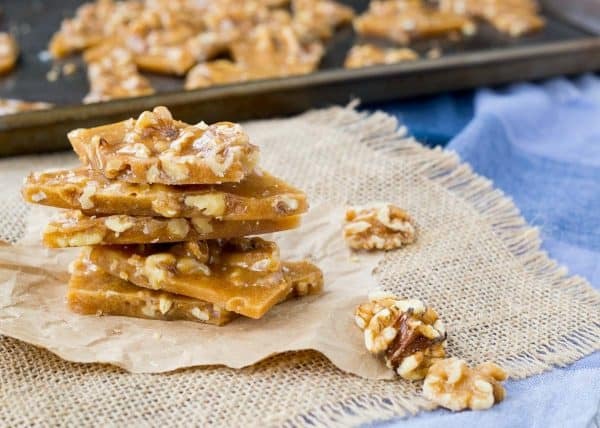 ), this walnut brittle is practically health food. Okay, maybe not. It’s definitely a treat but it’s a treat with some benefits. Cinnamon is great for you too! The sugar…well….it’s the holidays. And you’re going to be sharing with lots of friends and family. It’s all good. Line a large rimmed baking sheet with parchment paper and spray parchment paper with nonstick cooking spray (or rub with butter). In a dry frying pan, toast walnuts over medium heat until fragrant (about 3-4 minutes). 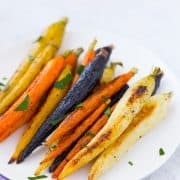 Remove from pan to a plate so they do not continue cooking. In a medium saucepan over medium-high heat, combine sugar, corn syrup, butter, cinnamon, cloves, and water. Stir until sugar is dissolved. Set candy thermometer in place, and continue cooking at a rapid boil without stirring or disturbing until mixture is an amber color, about 25 minutes or until candy thermometer reads 300 degrees Fahrenheit. Remove from heat and whisk in baking soda (it will bubble!). 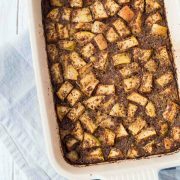 Stir in walnuts, working quickly, and then immediately scrape brittle onto prepared baking sheet, spreading it out into an even layer. Sprinkle with flaked sea salt if desired. Let cool completely before breaking into pieces and storing in an airtight container. Tip: Spray measuring cup with nonstick spray before measuring corn syrup – it will slide right out of the cup! Verdict: I adore this brittle. The warm spices with the toasted walnuts are the perfect complement to the sweet brittle. Husband’s take: He likes this too! He prefers things unsalted, but I saved him a few pieces without a lot of salt. He also brought some to work to share with coworkers and I heard they loved it too. Difficulty: If you’re new to making brittle or candy, I’d say this is moderate difficulty. Make sure to read the directions through carefully before starting the recipe and resist the temptation to stir the boiling sugar mixture! If you’re a beginner, I’d definitely recommend using a candy thermometer – it really helps to know exactly when to pull the pan off the heat. 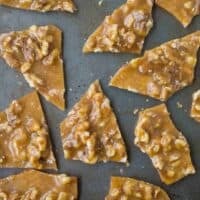 This Walnut Brittle Recipe is sponsored by the California Walnut Board. All opinions are always my own. Thank you for supporting Rachel Cooks by reading about products and food I use and love in my own home. So amazing looking – perfectly made! Oh we love brittle at our house! I want to make this! I need to make this! It is the peanuts in peanut brittle that I’ve never been overly fond of. 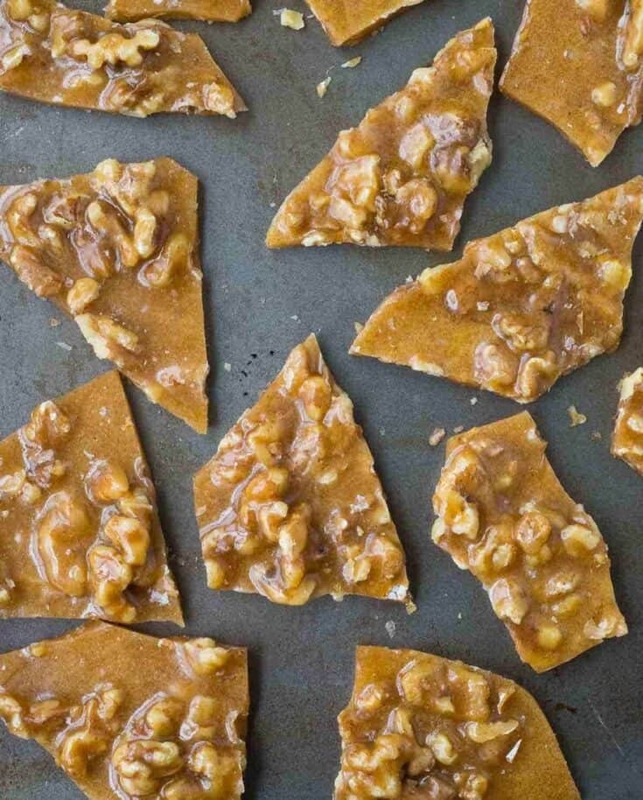 This fabulous brittle would made a terrific holiday gift! The cinnamon makes it so festive and I love the idea of using walnuts instead of peanuts—extra yummy! 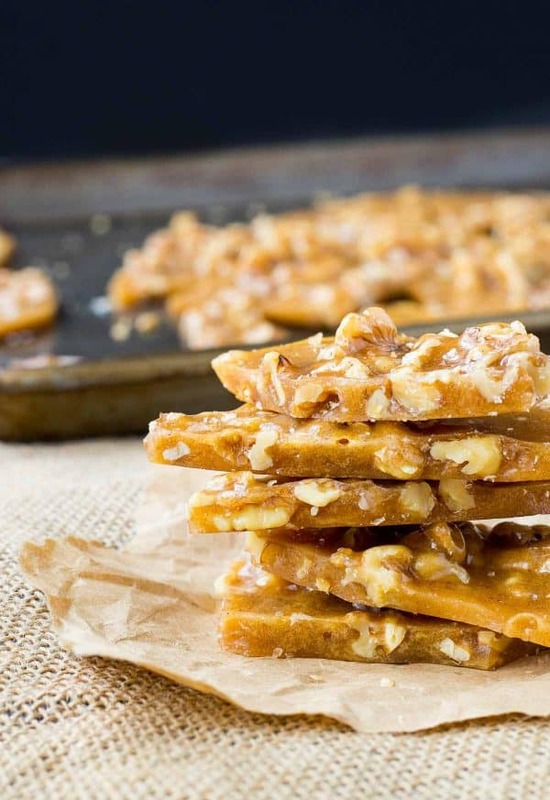 Love the walnuts and cinnamon in this brittle! It’s a perfect treat for the holidays! The recipe looks great, but when I went through the method, I see that Baking Soda and water are referenced, but they dont appear in the ingredients list. Am I missing something?